Whether they’re chocolate chip, oatmeal raisin or peanut butter, nothing is homier or more comforting than warm cookies fresh from the oven, but the perfect cookie can be elusive. Achieving that golden-crisp exterior and a chewy, melt-in-your-mouth interior is something that has befuddled moms and pastry chefs alike. Luckily Doughmakers Gourmet Cookware has cracked the cookie code. (Hint: It’s not the recipe!) Developed by two mothers who loved to bake for fundraisers, this cookie sheet’s unique pebbled surface allows air to circulate under the dough for even browning. So anyone—even teens—can get professional results. As a bonus, Doughmakers Gourmet Cookware is also eco-friendly. Their products are made mostly out of recycled aluminum (which conducts heat better than steel), so you can fill up the cookie jar with less guilt! Made from solid uncoated aluminum here in the USA, Pebbleware LLC is proud to offer Doughmakers Brand Bakeware. Created for everyday at-home use, but preferred by professionals, Doughmakers never need aerosol sprays, and they offer the added benefits of an easy release surface, maximum heat transfer and distribution. The Original Pebble Pattern surface of Doughmakers Brand Bakeware provides the consistency and texture sought out in the finest bakeries. Any typical bakery will swear by an aluminum baking pan for their longevity and even browning properties. The Original Pebble Pattern textured surface allows air flow to surround baked goods, creating perfect browning and easy release. 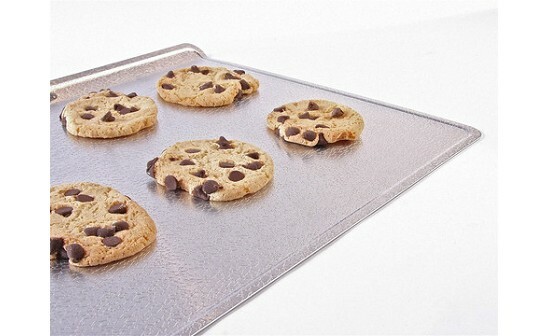 We sincerely hope you’ll try one of our baking sheets, and experience the difference. We look forward to your comments and will be checking in often to answer any questions! The bumpy surface totally makes sense to me! This is an ah-ha moment.... I have never even considered that the flat jellypan that I've been using could be the reason our cookies get really hard on the bottom. If my family is reading this, get me this pan for Mothers' Day, (please) and I'll make you a batch. What a great idea!! I've always struggled to make the perfect batch of cookies...they usually get too hard on the bottom. The design makes perfect sense. I can't wait to try it and what a great idea for birthday and shower gifts! Melt butter and mix with sugars, then add eggs and vanilla. then dry stuff. refrigerate overnight. bake preheated 400 degree oven. 10 minutes. One optional secret ingredient is to add a 1/2 cup of white wine vinegar to the wets; extra chewy. This looks like a good pan for making pizza. Do you have a round pizza pan? A quick question. The surface doesn't seem to be non-stick. Should I use butter or margarine? Will that cause the same problem as aerosol spray? I LOVE cookies and this looks like it would be a really great addition to my kitchen!! We do offer a variety of baking pans! Pie Pans, pizza pans, jelly roll, cake , sheet cake, and even loaf pans! I just ordered 2! I've been having cookie problems -- these look like they'll be great. I love cookies. This looks great! @Vanessa - You make a good point. Though our goal was to highlight our favorite cookie sheets, there are many more types of pans from Doughmakers with the pebble pattern - including the pizza pan, as Lance pointed out. So to make it easier for everyone who wants to find them, we've added them to our "store." Now, when you click on "Get it Now" you'll also see the pizza pans, cake pans, muffin pans, and loaf pan. Enjoy! will the pizza pan be good for re-heating store-bought pizzas? i.e., will it keep the crust crisp? j.m. ,would you like the cookie sheet? 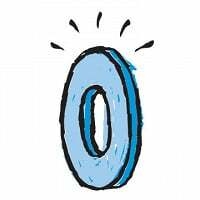 I seem to remember ruining yours. The trick is to pick the appropriate size pizza pan as the store pizzas come in a variety of sizes...I use the 15" as it will usually hold any store pizza, and more often than not, has a large enough size to give some extra space around the edge of the crust to get the pizza off the pan with even more ease! We love the "Neiman Marcus" cookie recipe: 1 c butter, 2 c flour, 1 tsp. baking soda, 1 c sugar, 2 1/2 c blended oatmeal, 12 oz. chocolate chips, 1/2 c light brown sugar, 1/2 c dark brown sugar, 1/2 tsp. salt, 1 8 oz. chocolate bar chunked up, 2 eggs, 1 tsp. baking powder, 1 1/2 c chopped nuts, 1 - 2 tsp. vanilla, Cream the butter and both sugars. Add eggs and vanilla; mix together with flour, oatmeal, salt, baking powder, and soda. Add chocolate chips, chocolate bar and nuts. Roll into balls and place two inches apart on a cookie sheet. Bake for 10 minutes at 375 degrees. Makes 56 cookies. Also, want to try the recipe on the blog page-- never heard of using white chocolate pudding mix, sounds great! @marie LOL! How many years have you been carrying that guilt around? And I'm sure it had nothing to do with the kids "helping" you make all those cookies by the way! These do look pretty nice though ... are you offering to come bake more cookies with us if I buy these?! Do not overbake....best 4 hours later when they have cooled down and have sat out...IF YOU CAN WAIT THAT LONG! Also, spoon balls of dough onto a plate lined with wax paper and set in freezer. Once frozen put in ziploc bag. Now you can have a couple cookies (instead of a whole batch) next time you want some! Just tried my cookie sheets -- what a difference! Great product!!! You don't need a cookie sheet! I just silicone baking mats for EVERYTHING. Its great for pies since the silicone wipes up better than scrubbing a cookie sheet! I like the idea of freezing the uncooked dough; however, I am a little concerned about freezing these with uncooked egg. Any thoughts? Thanks Kate for sharing your personal touch for cookie recipe. Yum! google 'freezing uncooked eggs' and see what you come up with. Freezing eggs is an excellent way to take advantage of sales. I use ziplock bags. Simply put the number of eggs (out of the shell of course) that you'd normally use in your recipies into the bag, seal, and lay flat on a cookie sheet in the freezer until frozen. This way they stack nicely and thaw more quickly. Generally I freeze 3 eggs in a bag. It doesn't take long to thaw but if you are in a hurry pop the still sealed bag into a pan of water. Thanks for all of the advice about freezing uncooked eggs! Our community is a very smart bunch. Whether they’re chocolate chip, oatmeal raisin or peanut butter, nothing is homier or more comforting than warm cookies fresh from the oven, but the perfect cookie can be elusive. Achieving that golden-crisp exterior and a chewy, melt-in-your-mouth interior is something that has befuddled moms and pastry chefs alike. Luckily Doughmakers Gourmet Cookware has cracked the cookie code. (Hint: It’s not the recipe!) 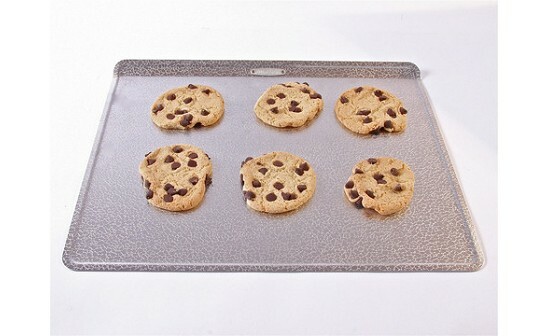 Developed by two mothers who loved to bake for fundraisers, this cookie sheet’s unique pebbled surface allows air to circulate under the dough for even browning. So anyone—even teens—can get professional results.